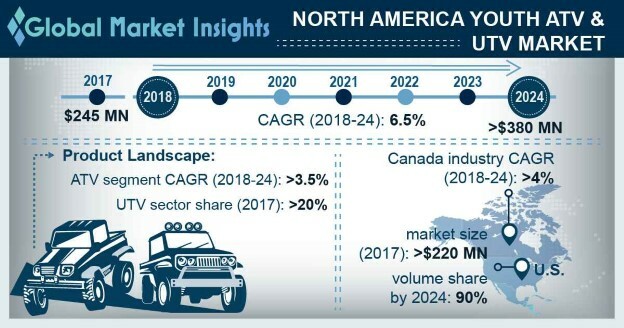 North America Youth ATV & UTV Market size is estimated to surpass USD 383 million by 2024; according to a new research report by Global Market Insights, Inc.
Increasing recreational spending along with the rising number of off-roading events are driving the North America youth ATV & UTV market share over the forecast timeframe. Increasing preference of youth to opt for adventure off-roading events including participation in several ATV and UTV races owing to the availability of diversified models at varied price range are supporting the business growth. The youth ATV segment accounted for over 80% volume share in 2017. This dominance can be attributed to the availability of diversified youth ATV & UTV model range at varied price range. The ability to travel through any terrain along with the compact footprint and easier parking & towing facilities will further strengthen the segment dominance over the forecast timeframe. Industry participants are actively working on introducing advanced technologies in their product line-up including independent suspension, electronic fuel injection system, continuously variable transmission, and capacitor discharge ignition system. These features augment the appeal of the product by reducing the driver fatigue and enhancing the off-road capabilities of the vehicles significantly, thereby positively influencing the North America youth ATV & UTV market share. Continuous government support for upgradation and construction of off-roading trails plays a significant role in the industry growth. For instance, in 2017, the State National Resources Board announced the expansion of the Northern Highland-American Legion State Forest with off-road trails for facilitating ATVs and UTVs events. Stringent government regulations regarding the driver and passenger safety are playing a major role in the increased adoption of such products. The mandatory wearing of safety gear and undergoing safety training programs are further strengthening the North America youth ATV & UTV market share over the study timeframe. The rising number of accidents owing to rash driving by the youth along with stringent age restrictions by the government may hamper the North America youth ATV & UTV industry growth over the forecast timeframe. For instance, in 2016, according to the Consumer Product Safety Commission (CPSC), total reported ATV related deaths accounted for 337 in the U.S. The gasoline segment dominated the North America youth ATV & UTV market size with a revenue share of over 90%. This can be credited to the availability of diversified engine options with varied power, torque, and cubic capacities. Further, the availability of a vast network of fuel stations will positively influence the business growth till 2024. The electric vehicle segment will showcase an 8% CAGR over the study timeframe owing to the benefits offered by these vehicles compared to the gasoline engines including no engine noise, lower carbon emissions, enhanced efficiency, and lower operating and maintenance costs. The significantly high power and torque outputs from such vehicles will further support the business growth till 2024. The youth UTV segment will grow significantly at 6% CAGR from 2018 to 2024 owing to the availability of standard safety equipment compared to the ATVs including a roll cage, seatbelts, and windshield. Further, the ability to accommodate multiple passengers further propels the North America youth ATV & UTV revenue generation over the projected timeframe. The U.S. youth ATV & UTV market will account for the maximum volume share of around 90% by 2024. This can be credited to the increasing recreational participation and the presence of multiple off-road trails in the country. The Pennsylvania state will showcase 5% CAGR from 2018 to 2024 owing to the presence of a vast network of trails that are maintained by the Pennsylvania Department of Conservation and Natural Resources. The Ontario state in Canada accounted for the maximum volume and revenue share in 2017. This dominance is attributed to the presence of multiple clubs promoting the construction of sustainable, safe, and legal trails across the province. The proliferating off-roads events organized by the Ontario Federation of ATV clubs further strengthens the North America youth ATV & UTV market share over the forecast timeframe. The prominent players in the North America youth ATV & UTV marketplace include BRP, Arctic Cat, KYMCO, Polaris Industries, Honda Motors, Suzuki Motor Corporation, and Yamaha Motor Corporation. Other notable players include Hisun Motors, Kawasaki Motors Corporation, Apex ATV Racing, DRR USA, Massimo Motorsports, SSR Motorsports, and Venom Motorsports. Industry participants are actively involved in introducing technological features to differentiate their portfolio. For instance, in 2018, Arctic Cat introduced the upgraded DVX 90 model with fully independent front suspension for enhancing comfort while off-roading.